Stop guessing what nutrients are in the foods you are eating. Use Cook'n to help you stay organized in your dieting! Cook'n makes it simple to calculate the nutrients your body is receiving. After typing in a recipe or importing one from the internet, simply click a button for the information you need. Save you a ton of time by analyzing nutrition in seconds! 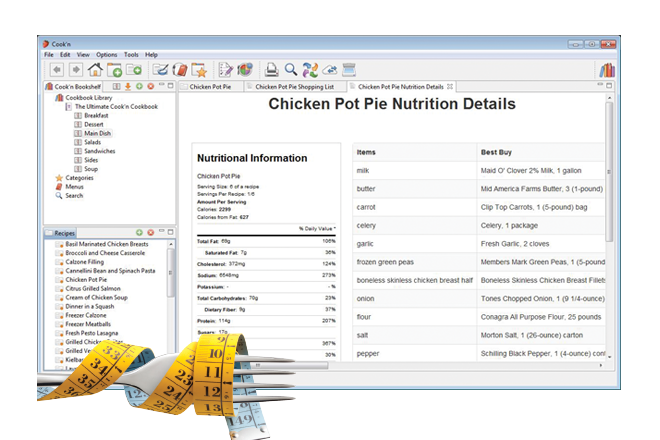 You don't have to be a nutritionist to understand how to analyze your recipes -- that's because Cook'n nutrition facts window looks just like the label on a can. Cook'n has nutrition facts from the labels of over 10,000 food products. You can even choose between different brands to see what the nutritional effect is. Stop the guesswork among different brands and know which one is most appropriate for your needs. When printing out a recipe or cookbook, Cook'n gives you the option to include nutritional information right underneath the recipe. Now you can plan menus based on dietary needs and tastes. Prepare healthy, delicious meals for the entire family.